Plus, Mayor Quan's 100 Blocks plan should have been a 1,300 blocks plan. For the past decade, Ben Chavis and his American Indian Public Charter schools in Oakland have gotten away with egregious conduct that would be considered grossly unacceptable for any other school — because their students have high test scores. First, there was the revelation that Chavis routinely abused his students verbally, humiliating them in front of their classmates, to force them to score higher on tests or quit the school altogether. Then came the news that Chavis had hurled racist and sexist comments at others in front of students, and that his schools had stopped serving American Indian children. But that's not all. Earlier this year, a draft report by state auditors uncovered evidence that Chavis, a former principal of one of the schools who now assumes a somewhat ambiguous leadership role at all three, had engaged in fraud and was illegally pocketing taxpayer funds. Then last week, the Express reported that one of the schools' eye-popping test scores appear to be the product not of academic excellence. Instead, there's evidence that the school routinely cherry-picks top students from local elementary schools, in violation of district regulations. At minimum, Chavis' schools appear to be nothing more than a rigged system in which mostly high-scoring students apply to get in, are accepted, and then continue to score well on tests. Then, the state's final audit came out late last week and revealed some truly disturbing allegations, including $350,000 in improper payouts to Chavis' wife; $355,000 to Chavis for a summer-school program that violated state law; and $348,000 to companies Chavis owns that did unauthorized construction projects. Alameda County schools Superintendent Sheila Jordan requested the audit after receiving complaints of financial impropriety from former school employees by Chavis and his wife. Jordan has turned the final audit results over to the Alameda County District Attorney's Office for possible criminal prosecution. Although the final audit is damning, the Oakland school board has known about Chavis' misconduct for years and yet has repeatedly voted to renew and extend his charter school licenses. In April, after the draft audit report came out, and Oakland schools Superintendent Tony Smith recommended strongly that the board deny the charter renewal request for American Indian Public Charter School II, a majority of school board members — Noel Gallo, Alice Spearman, Chris Dobbins, and Jumoke Hinton Hodge — voted to renew it. Gallo and Spearman, longtime supporters of the school, led the charge on its behalf, touting the same justification that they have used for years: outstanding test scores. In other words, for Gallo, Spearman, Dobbins, and Hinton Hodge, it apparently doesn't matter whether a school leader verbally abuses kids, hurls racial and sexist epithets, and engages in fraud, as long as his schools do exceptionally well on state tests. 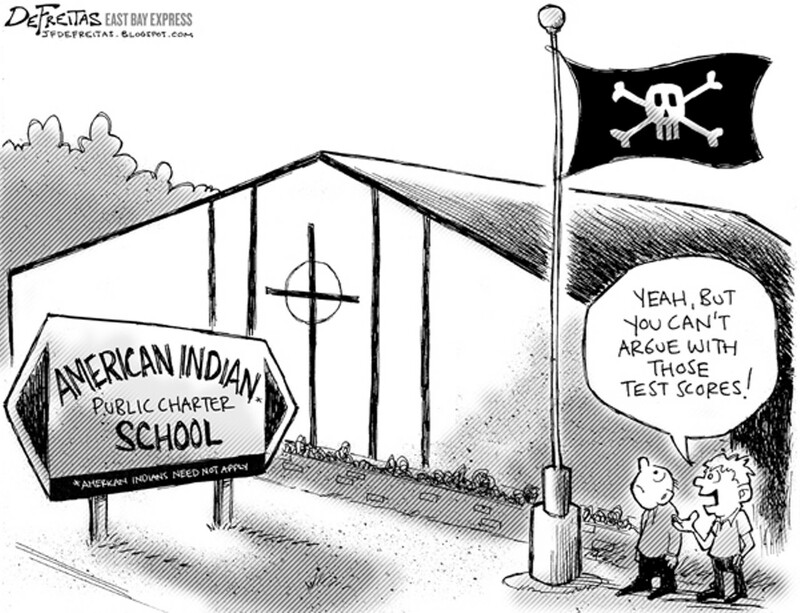 Indeed, the entire story of Chavis and American Indian Public Charter schools represents the prime example of our society's extreme overemphasis on standardized testing — that high test scores trump everything else, including honesty, student dignity, and teaching kids that bigotry is wrong. They're not. And it's way past time for Gallo, Spearman, Dobbins, and Hinton Hodge to recognize that fact and do what's right: revoke American Indian Public Charter schools' licenses. Oakland Mayor Jean Quan's so-called 100 Blocks crime plan deserved skepticism from the start. The idea that redeploying Oakland police to focus on one hundred of the most violent blocks in the city in order to reduce crime overall may have sounded appealing to the mayor, but it was never backed up by solid research. In fact, neither the mayor nor the OPD has been able to point to another city that has implemented such a plan successfully. Moreover, last week the Urban Strategies Council, a longtime nonprofit that has focused for years on crime and its root problems in Oakland, found even more flaws in the 100 Blocks plan. Since the mayor introduced the plan last October, she and other city officials have justified it by contending that "90 percent" of the city's homicides and shootings occur in the one hundred blocks they are targeting. But the Urban Strategies Council's study showed conclusively that this claim is inaccurate. The group analyzed homicides and shootings in Oakland from 2007 to 2011 and found that only 17 percent of the city's homicides and shootings occurred in the one hundred blocks that experienced the most of these crimes. Moreover, the study found that the city would have to target more than 1,300 blocks in order to combat the 90 percent of homicides and shootings that occur each year in Oakland. In other words, the mayor's 100 Blocks plan should have been the 1,300 Blocks plan. The mayor's office defended its plan, saying it and police used different data — from 2009 and 2010 — than Urban Strategies Council did. But looking at the city's crime reports over the past half-decade, the mayor's argument about using different data doesn't stand up to scrutiny. Indeed, it's impossible to find one hundred blocks in Oakland that account for 90 percent of the city's annual killings and shootings, no matter what years you analyze. "It's just not possible," said Steve Spiker, Urban Strategies Council's director of research and technology. Spiker is right, and in hindsight, it should have been obvious. There are 6,560 Census blocks in Oakland, and the idea that 90 percent of the homicides and shootings are occurring in just 100 — or 1.5 percent — of them defies basic logic. If that were true, then those one hundred blocks would be among the most violent places on Earth. They're not, of course, but that's not to say that violent crime isn't concentrated in certain parts of the city, because it is. The Urban Strategies Council report proves it definitively. The report shows that 90 percent of Oakland's killings and shootings occur in just one-fifth, or 20 percent, of all the blocks in the city (1,303 blocks out of 6,560 is 19.9 percent). In other words, the report verified what Oaklanders have known for years — that most of Oakland, four-fifths of the city, in fact, is relatively safe, while one-fifth of it is very violent. As such, the media portrayal of Oakland as being overrun by violent crime is patently false. Nonetheless, we're skeptical as to whether Quan's plan would work even if she targeted 1,300 blocks rather than 100. The problem with hotspot policing — focusing cops on certain areas in a security guard-like approach — is that it tends to push crime to other parts of a community. Criminals, after all, are not going to be dissuaded from committing crimes if they see cops in one neighborhood and know that they can commit crimes in other neighborhoods without worry of being caught. Even the US Department of Justice recognizes that hotspot policing doesn't work. A DOJ analysis of a hotspot-policing program in Jacksonville, Florida, from 2003 to 2008 concluded that it had no effect on overall crime there. Unfortunately, Oakland has had a longstanding infatuation with hotspot policing that predates Quan. Oakland police under mayors Ron Dellums and Jerry Brown practiced such tactics for years without success. And yet, for some reason, city leaders keep going back to it, somehow thinking that it will eventually lower crime in Oakland's most violent neighborhoods. At the same time, the city has ignored what does work — old-fashioned policing: investigating crimes, solving them, building good cases, arresting the perpetrators, and winning convictions. We have long advocated for such tactics, but Oakland police and city leaders have never fully embraced them — perhaps because they require hard work and determination. And yet there's recent evidence to show that they're effective. A months-long undercover operation involving federal agents and local law enforcement known as Project Gideon III targeted some of Oakland's most violent criminals this year, and investigators worked diligently to apprehend them and put them behind bars. Even Oakland Police Chief Howard Jordan now contends that Project Gideon III has had a significant impact on crime in the city. In a press release this week, Jordan noted that violent crimes were down 14 percent in May compared to April. As such, perhaps it's time for the mayor, the police department, and city leaders to finally shelve hotspot policing and ideas like the 100 Blocks plan, and instead recognize that one of the most effective ways to reduce violent crime is to have cops to investigate it and solve it.